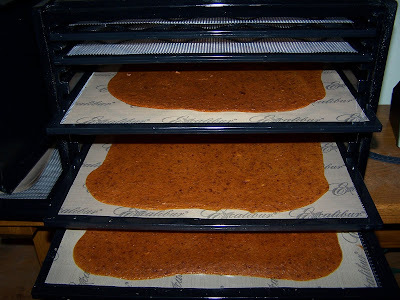 Drying has to be one of the oldest methods of food preservation known to man. Currently, the ever popular "fruit roll ups" and sun-dried tomatoes have kids and grown-ups alike exposed to it! Almost any food can be dehydrated, but for the best results, you need to use the freshest food possible. The exception to this could be the fruit leather I made yesterday. I had peaches and nectarines that were overly ripe and on the verge of being tossed out to the chickens. Instead, I washed, pitted, and chopped coarsely the whole mess of 'em. Tossed them in my handy dandy blender and pureed toll smooth. Poured it onto my Paraflexx lined trays and set the temp to 135. So delish...crunchy, salty...perfect for a mid-day snack. Granola...SO yummy in a bowl of yogurt! Organic, dried sage for all my winter soups, stews and Thanksgiving bread stuffing! And coming up next....my home grown, organic, heirloom tomatoes! I just saw a recipe for soy sauce dipped zucchini slices! Bag us a deer this fall! I have been having a great time learning all about this "new to me" option in food preserving. Oh, I'll still be canning, freezing, and fermenting...no doubt. But food dehydration has opened up a whole new world of possibilities for me! the next few weeks are peak produce times here in the garden, at our CSA, and the local farmers markets. 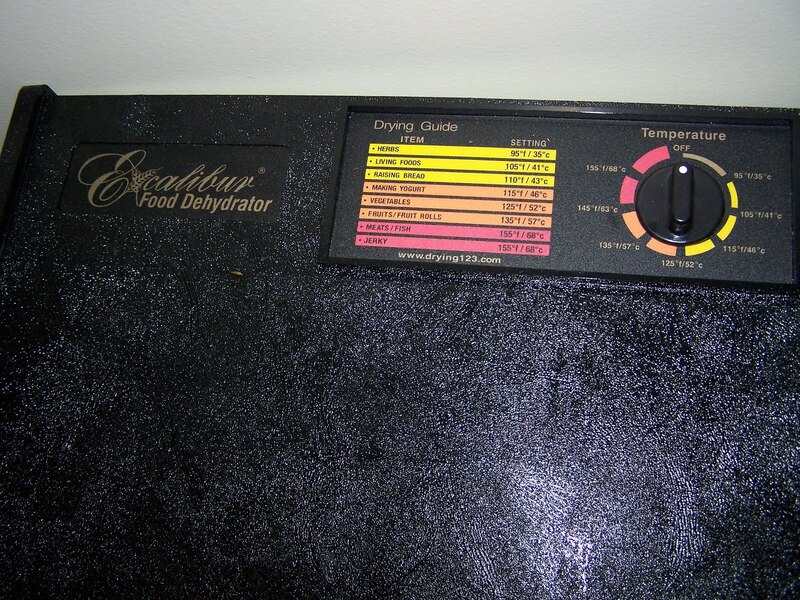 And fortunately, I have the best possible dehydrator to work with. What are YOU busy doing this weekend? Anything new happening in YOUR kitchens? You can always tell when I'm super excited about something by all my hyped up punctuation! I have friends who make apple leather every year. Been thinking of getting on the bandwagon for that. lol. Here's my new blog address. Been missing your comments! Just not the same without Cindy over on my blog. Oh, and yes you can add it to your blogroll even though it's private. I love my excalibur and really should use it for fruit leather. I know the girls would love that. But you really reminded me of what I can do with those three huge zucchini that I overlooked in the garden and grew to a gigantic size. I'll try dehydrating them for zucchini chips! O my ... you are on a roll! This weekend, we're harvesting lots of apples. They seem to be ripening about a week earlier than usual. We have a lawn bag half full with just the ones that fell to the ground! So ... you know what I'll be doing ---apple sauce, apple pie, apple crisp! Here, in upstate, NY ... it's sunny and beautiful! 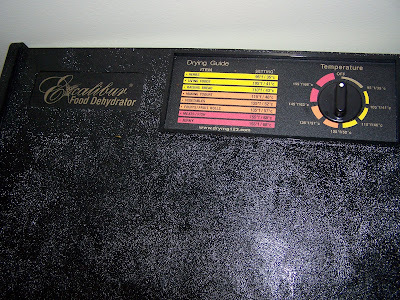 While I don't have an Excalibur, I do have a large food dehydrator and LOVE it!! This year I've dried apricots so far, but will also be working on some fruit leather and want to try drying some tomatoes too. Apples, bananas and cherries are a favorite here too. I did some zucchini last year, just lightly salted. It is the perfect little snack...SO good! Hmmm... okay, good to know that it's not showing up on the blogroll. I am going to temporarily remove the private feature and see if that makes a difference. I don't think there is any risk of blog being found at this point. Let me know if it bumps up at all in the next few hours or days. Thanks! Love exclamation marks!! Today I ground flour and made homemade mayo for my hubby. I love my Excalibur as well. One the my favorite things about it is exactly what you mentioned. When produce is too far gone for fresh eating, or you've got too much of it, you can quickly make good use of it by dehydration. I love to stop by the carts of old produce in the grocery store, very often tomatoes and bananas, and bring that home to dry it. Half price, and perfect sugar content.